How to determine which columns are prominently displayed in a view. Row Labels allow you to choose the most important columns in a table. Row labels determine which columns are prominently displayed for that table, kind of like a title. One image column and one non-image column can be used as labels. All tables have a non-image label. You designate the Row Label on the Data > Columns tab by setting the "Row Label" attribute to true for the appropriate column. 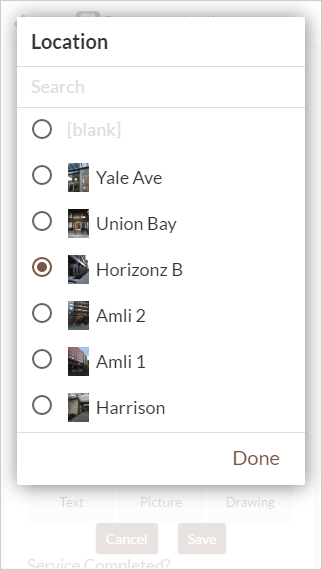 Add a virtual column to the table. Reset the "Row Label" property for any existing row label column. Set the "Row Label" property of the virtual column. Row Labels are used throughout the app, different views use them differently. In the Deck view the image label is used for the image on the left, and the non-image label is used as the top text. In the Detail view (previously Slideshow view) the image label is shown as a large image on top, and the non-image label is shown directly below the image. The Ref popup, which is shown when choosing a Ref row from the form, also uses the labels as shown in the Property Audit sample.